In this strange and crazy world, not many of us can predict certain things that are happening right now in the world, from an insane egomaniac being seated in the Oval Office to the wrong Best Picture winner being read out on live television, and certainly not least that one of the freshest voices in horror at the moment is one-half of comedy duo Key and Peele. 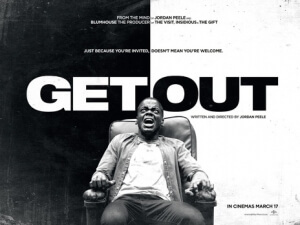 Yes, Jordan Peele is behind the new horror sensation Get Out, making his directorial and solo writing debut for something which has taken America by storm with an unprecedented 99% Rotten Tomatoes score – the highest for any horror film, let alone any mainstream movie, in recent memory – and high box office intake in its opening weekend alone. Even with those credentials, it is still impossible to really believe that such a film can have the power to resonate with so many people, regardless of whatever genre it may be, but I can safely say that now having finally seen it, I know exactly what the fuss is about, and like everyone else I have to stand here and tell you how you definitely should see this film. The plot, if you’re not familiar, sees a guy named Chris (Daniel Kaluuya) preparing to meet his girlfriend Rose’s (Allison Williams) parents, Dean (Bradley Whitford) and Missy (Catherine Keener), though he’s nervous about the fact that she hasn’t told them that he is black. She tells him that it won’t make a difference, and once they arrive it appears to be true, since aside from some awkwardness on their part to show their coolness with his race – Dean mentions he would’ve voted for Barack Obama a third time if he could have, and mentions his father competed in the same races as black athlete Jesse Owens – they seem to be accepting and friendly people. Of course, this being a horror film, that turns out to not be the case at all, and a sinister plot that involves missing local black people, Missy’s powerful hypnotism skills, the creepy-as-hell black house workers, and their equally white and wealthy friends comes to light, leaving Chris in a rather tough situation indeed. A lot has already been made about Get Out’s smart and subversive social commentary about race relations in 21st century America, and how amongst middle-class liberals like Rose’s parents and their friends it’s casually clueless but also very creepy, especially in its final third. I’m not sure if I can offer any further insight into it that a lot of other reviewers have managed to do, but I will say that as a casual viewer I felt it was very sublimely handled and executed by Peele, offering a different kind of conversation about racism that not many of us are willing to actually have with each other. It digs up some very uncomfortable truths about how open-minded yet also closed-minded we as a society can be when it comes to interacting with other races, and it’s very clever in how it portrays that element as something we should very much be afraid of, which is sadly a little too true in today’s real-life prejudice in society. But aside from bringing to light these uncomfortable truths, Get Out still works as a legitimately effective horror film. Peele doesn’t overindulge that much in jump-scares with loud musical stingers, or fake-out dream sequences that you usually see in many other lesser horror films, and instead uses scares that come from a far more subtle place, like the creepy nature of the black servants – there’s a really chilling scene where one of them is talking happily while tears are just streaming down their face; to explain why this is would be to give away a large chunk of the film’s twists – or just the feeling of being in a place where you stick out like a sore thumb, with Chris being increasingly smothered by the white people he’s surrounded by. It’s not afraid to even get a little more abstract with its scares, such as a stand-out sequence that will ensure you never hear tea being stirred the same way again, and where it becomes very ambitious with its visuals, so much so you’re wondering if you’re watching a cut scene from Jonathan Glazer’s Under The Skin. All the while, however, you’re constantly entertained by the sly commentary being offered under the surface, and certainly with the sinister and terrifying scares being provided at a more obvious level. There are areas of this film I cannot touch upon without going into full spoilers, as they are part of what makes this film really work, but know that Peele has made a smart, incredibly entertaining horror film that throws you for a loop with its sheer unpredictability and satisfactory execution. The best way to describe this film is to imagine Guess Who’s Coming To Dinner as directed by William Friedkin or Rosemary’s Baby-era Roman Polanksi; however, Peele has proven with just one film to his name as director and solo writer that he can compete on the same level as those horror filmmakers, based on its intelligent insight into modern day race relations and just how bloody frightening they can be. And in an age where racism is very much alive and even encouraged by politicians and far-right authority figures, there’s never been a better time for Get Out to make its mark on the horror genre. Get Out is a very smart and effective horror film that tackles modern day race relations within middle-class liberals, at once offering a sly and thought-provoking social commentary and also an extremely entertaining genre film, wherein first-time director Jordan Peele paces the scares just right with the perfect amount of pacing and execution to make audiences feel on edge the whole time, all the while making sure that they have fun with what they are watching on the big screen.